In our territorial widths the most frequent kind of pests of lifeless wooden is the woodboring beetle (Anobium punctatum), is less often widespread Xestobium rufovillosum. Before coupling Xestobium rufovillosum have among themselves an effect knocking with a head about a nest wall. In a dry wooden the rhythmic sounds are distributed, which superstitious people name «hours of death». 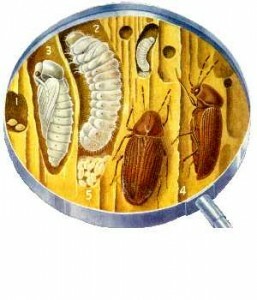 In intestines of maggots of the woodboring beetle the body which contains the special microorganisms splitting cellulose, thereby providing nitric connections so necessary for the wrecker is placed. Maggots of the woodboring beetle damage a wood core, an external part the hatched beetle gnaws only when is going to move in other place of living. Presence the woodboring beetle, which made a hole don’t mean that the wrecker still there to be. With clearness it is possible to tell about presence of the woodboring beetle only in the event that the input in a mink had a new handful of a wood dust which the wrecker pushes out eating of wood. If handfuls of a dust aren’t present, the pest already means has left the burrow. Hardly audible percussion frequently testifies to presence of the pest. For owners of ancient wooden buildings it is necessary to regularly estimate a condition of wooden designs of a construction. 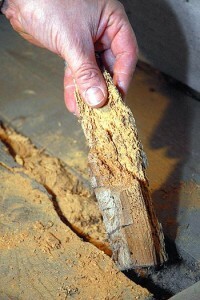 Activity of the pests in temples one of factors of destruction of wooden designs. We suggest to process a furniture surface with the poison made in Germany for woodboring beetles on the basis of the oils made from a dried peel of oranges. 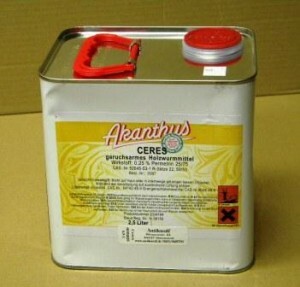 The poison is harmless to the person. Poison put on a surface of a good or by syringe enter in a mink of the pests. Eating the wood absorbed by poison the pest in due dies.